Summer is almost over and I think we’re finally ready for Fall. Our summer vacation was filled with trips to the pool, the beach and campfires. All those pool trips and summer sun were tough on my skin! What’s a Mom to do? I needed to find a beauty routine that was fast and easy so that I could keep up with all the summer fun my kids had planned. 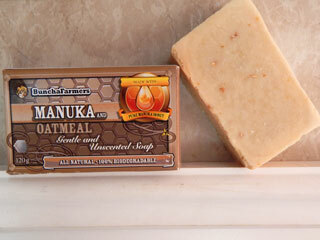 “Manuka and Oatmeal Gentle and Unscented Soap” from BunchaFarmers. They have created a wonderful all natural soap that is perfect for sensitive skin. The ingredient list is simple, I can pronounce all of the ingredients – Manuka Honey, Saponified Olive Oil, Coconut, Palm and Vegetable Oils and Oatmeal. The “Manuka and Oatmeal” soap leaves my skin feeling clean and moisturized. 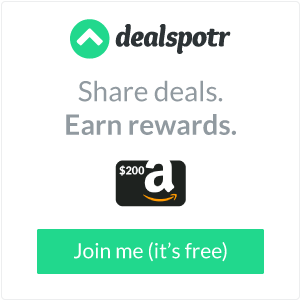 I didn’t experience any breakouts or dry skin patches that I have with other soaps. There is a nice lather that I get when I use it. The soap is unscented but I find that even unscented products have their own smell. I love the “Fresh and Clean” scent that I get from this soap. I always slice my bars of soap into smaller pieces to avoid having mushy bars of soap. The soap slices cleanly, with no flaking as is the case with many other bars. It also proved to be unnecessary as the bar didn’t turn into a mushy mess while sitting in my shower. Manuka honey is said to be a healing honey. Honey is naturally anti-bacterial so it only makes sense to have it in your skin car products. In fact, it seems to have helped to clear up the blackheads that tend to appear on my nose! The “Manuka and Oatmeal” also comes in other scents, Honey and Lavender, Honey and Lemongrass and the Unscented one in my review. The makers of this great soap are a dedicated group of farmers and local artisans who want to make great natural products at an affordable price. For more information or to purchase their products you can find BunchaFarmers on Facebook, Pinterest and their website. *Disclosure: I received a complimentary bar of “Manuka and Oatmeal” Soap in exchange for my review. All opinions are 100% my own.